EUvsDisinfo is a website set up by EU leaders in 2015 to allegedly fight “Russian propaganda”. 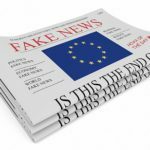 Though officially it does not represent the opinion of the EU, it uses its symbols and receives its funding from it, making EUvsDisinfo a de-facto governmental institution that is in charge of deciding what constitutes fake news and what is correct information. As a part of its activity it creates a list of “wrongdoers”. No wonder then that it has evoked associations with the Orwellian Ministry of Truth. Fast forward 2017, a number of Dutch news sites, De Gelderlander, TPO and GeenStijl, ended up on the list of the naughty for exposing the Nazi-inspired groups in the Maidan revolution, i.e. allegedly aligning themselves with the accusations that Russia often levels when talking about the events in Ukraine. EUvsDisinfo quickly slandered the websites for spreading fake news and echoing Russian propagandists, but they didn’t take into account the historical Dutch love for freedom. Freedom of speech and freedom of press are the cornerstones of Western societies. 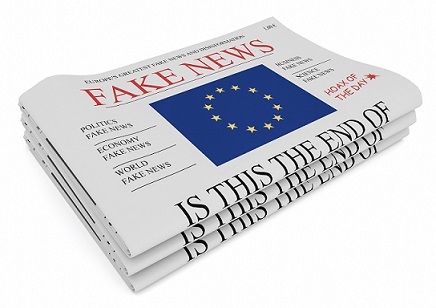 When EUvsDisinfo refused to back down, the Dutch sites took it to court and EUvsDisinfo, after receiving a subpoena, opted to rectify its reports: the stories on Ukraine turned out to be correct.1)Why the EU must close EUvsDisinfo, EUobserver 2018-03-26.The EU institution then captured national attention and other Dutch media went on to investigate how exactly it operates. Officially, EUvsDisinfo is informed by “a voluntary network of 400 experts, journalists, government officials, think-tanks and NGOs”. The Dutch media found out that reality is a bit different: 400 turned out to be only 10 who compile 75% of the reports. The remaining 390 “experts” produced 1-2 reports each and then stopped. Most importantly, the employees of the institution are anonymous and those who actually draw up the list of “pro-Russia propaganda websites” are only 3 people. That’s right: three anonymous EU officials are in charge of deciding what is fake news or Russian propaganda and what is not.2)Nepnieuwslijst EU afkhankelijk van tien vrijwilligers, NOS 2018-02-12.You can’t check their background, their political stance, their allegiances, anything. As the chart shows, the single most active contributor is Pavel Spirin, who was interviewed by the NOS on the topic and turned out to be an unemployed journalist who spends 10-15 hours a day watching Russian media. The only other regularly active journalists are Oleskandr Nykonorov of the Kyiv Post and Igor Solovey. The most active is “European Values”, operating through its unit “Kremlin Watch”, a Czech think-tank funded by the Open Society Foundations of George Soros;3)Annual Report 2015, European Values 2016. StopFake, which is also supported, though it’s unclear how, by Open Society Foundations;4)Understanding Ukraine, Open Society Foundations 2015-02.
the Hungarian “Political Capital Institute”, which lists among its donors Open Society Foundations;5)Partners and Donors, Political Capital Institute. the Czech “Prague Security Studies Institute”, which lists among its partners the Open Society Fund;6)Foundations and Institutions, PSSI. “Polygraph”, a fact-checker created by Radio Free Europe/Radio Liberty;7)About, Polygraph.Radio Free Europe/Radio Liberty collaborates with the Open Society Archives;8)Seven RFE/RL Collections now online at Open Society Archives, RadioFreeEurope/RadioLiberty 2013-06-24. “Myth Detector”, a Georgian organization. Georgians aren’t EU members, but this organization is funded by the usual Open Society Foundations9)Myth Detector, CSO.and that’s enough for credentials to work for an EU institution apparently. So, the institution that decides what’s true or untrue, EUvsDisinfo, not only is not transparent, but it’s also not impartial, as 5 out of 10 of its primary sources are funded by George Soros’s foundation, while at least one other is aligned to it. After the Dutch media found out how EUvsDisinfo operates, 10 out of 13 parties of the Dutch parliament voted to give mandate to the Dutch interior minister Kajsa Ollongren to convince other European governments to shut it down as the existence of the organization depends on the consensus of all the governments of the EU members. Ollongren’s opinion differs: she would like EUvsDisinfo to receive more funding from the EU to improve the organization’s capabilities. The Dutch parliament has already said that if she doesn’t deliver, they’ll ask Prime Minister Mark Rutte to meet other EU leaders for the same purpose. Time will tell. Will freedom triumph over this Orwellian, Soros-infected Ministry of Truth? 6. ↑ Foundations and Institutions, PSSI. 8. ↑ Seven RFE/RL Collections now online at Open Society Archives, RadioFreeEurope/RadioLiberty 2013-06-24. 9. ↑ Myth Detector, CSO.